Many thoughts are swirling around in my heart and mind today. The week of prayer and fasting mixed with the IF:Gathering mixed with Chad's message Sunday night make me feel like I've consumed five energy drinks while carrying a loaded semi up the hill. Energized, heavy, and a little crazy...that's me. I can't really make sense of it all today. Some of those blog posts will come out in the days to come. There were three specific burdens rekindled through the above mentioned experiences. One of them is to blog more because I actually enjoy it. Another one was to stick to my clearly defined boundaries in other areas of ministry which, incidentally, will afford me to opportunities to blog more. Do you see that little circle of convenience? If I don't meet with all the people in one week then I can blog and do some other things I love. By the way, this is not a commentary on any of you. The problem/awesomeness is I love to meet, invest in, and talk with women. I have to be the one that says, "I would love to get together, but I can't this week because my schedule is full." That isn't your job. It's mine. I own my issue of boundary ignoring. An area of atrophy in my life since my stroke is reading. You know I've already lamented on my blog about the difficulty of reading. My broken brain just wouldn't cooperate. It usually left me sad, frustrated, and exhausted. The fantastic, wonderful, fabulous news is that my brain continues to get better and better and stronger and stronger. My ability to read longer and retain what I've read is a tangible example of healing. Now don't get me wrong, I don't have the super power of reading like some of my friends do. (I'm looking at you John W., Steph K, Alisa W.) Some people can blow through a book in a minute or two, but that's not true for me. I would love to classify myself as an avid reader, but it would be a lie. However, I do aspire to be a disciplined reader. A few years ago I read a quote by Harry S. Truman. 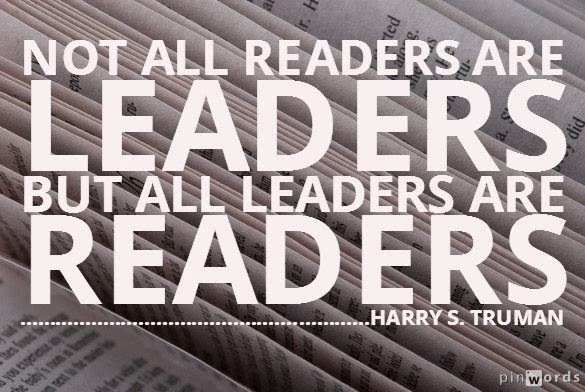 "Not all readers are leaders, but all leaders are readers." It deeply resonated with my desire to grow in leadership. It fortified a disciplined determination to read. Whenever people tell me they don't read because they just don't like it, I'm left a little shocked. Guess what? I don't like it either. I like baking and sipping iced tea, but if all I do is bake cookies and drink tea I'm going to be a fat old lady with brown teeth. Reading will make me stronger, smarter, more influential. If you don't want to influence anyone, then fine. Don't read. As for me, I'm going to will myself into turning as many pages as my brain will allow and after a good rest, I plan to turn some more. To just blab on about reading, but not help anyone in their journey is lame. Therefore, to encourage the beauty of reading, I'm hosting my first blog give away. You are about to have the chance to win not one, but two prizes. I don't want to just tell you to read, I want to help you, so the big prize is a $30 gift card to Amazon. You can pick out some books that have been on your wish list. Side note, if you don't have books on your Amazon wish list, change that today. It is an easy way to keep a running list of books you hope to read in the future, even if you don't purchase them from Amazon. Of course I realize someone could take the $30 and buy this or this or this, but I'm hoping you won't. The second part of the prize is Shauna Niequist's book Bread & Wine. Many of you in my circle of friendship that hope to win have already read the book. If you win, give the book to someone who will enjoy it as much as you did. I love the way Shauna tells the story of her life. She weaves her words beautifully. I feel calm and inspired when I read her books. That, my friends, is a good combination of feelings. Anywho, you can enter to win by leaving a comment about what book you are reading or want to read. You can leave a comment with a verse you are memorizing because you all know how that makes my heart sing. You can click on the little follow this blog button on the side for an extra entry. If you already follow it counts as an entry. Finally, you can share this give away on Facebook or Twitter. You can enter six times. There ya have it! I will do the whole post the winner and stuff on Tuesday the 18th. One week. I'm looking forward to reading your comments already! 48 important comments so far. What are your thoughts? Currently reading The Locust Effect and Harry Potter 2 because I like balance. Cease striving and know that I am God. Psalm 46:10 a.m. Currently reading "Praying God's Word" by Beth Moore and "Les Miserables" by Victor Hugo (I LOVE that book....absolutely LOVE it.....will read it over and over for the rest of my life...that's how much I LOVE that book..OK. I'm done now). Working on Deut 17:19-20. I had never heard of the Bread & Wine book, so it is going in my wish list! Great post! Just really got back into reading this past month. PPS: Jamie, The Cure authors spoke at a baseball retreat the last 2 years. I really enjoyed reading that book. I'd really love to read "Notes from a blue bike". My heart yearns for simplicity and I feel like this one would feed my soul. I just finished Bread and Wine and loved it! (Thanks for the recommendation). If I won the gift card, I would buy Cold Tangerines. :) Currently working on Trophy Child by Ted Cunningham. I'm currently in the middle of two books: "The Gospel Centered Woman" by Wendy Alsup and "Bread and Wine" by Shauna Niequist. And I have an embarrassingly long list of books I would buy on Amazon. But Christine Caine's "Undaunted." I'm currently finishing "7" by Jen Hatmaker as I started it a couple months ago and then the holidays happend. ;) And, Emily, great minds think alike, as I'm memorizing Matt. 6:19-21 as well! I am really excited to read your future posts on what you've been learning and mulling over. As for book-worming, I am currently reading Desiring God by John Piper and am enjoying it a lot. It has been liberating to remember that Jesus is my ultimate joy and praising Him is simply the consummation of my joy. It has made worship, singing, and obedience to Him far more freeing. I'm memorizing Psalm 62:7-8 "On God rests my salvation and my glory; my mighty rock, my refuge is God. Trust in Him at all times, O people; pour out your heart before Him; God is a refuge for us. Selah." “Do not lay up for yourselves treasures on earth, where moth and rust destroy and where thieves break in and steal, but lay up for yourselves treasures in heaven, where neither moth nor rust destroys and where thieves do not break in and steal. For where your treasure is, there your heart will be also." I have just finished "Respectable Sins," but now have an entire stack that I want to read thanks to IF:LOCAL. But until I purchase/rent those, I picked up "Sacred Marriage." Also working through "The Respect Dare." Just finished reading "The Art of Choice" by Sheena Iyengar and started "7" by Jen Hatmaker. Memorizing Psalm 19:14 "May the words of my mouth and the meditation of my heart be pleasing in your sight, o Lord, my rock and my redeemer." I am currently reading a bunch of marriage books, and I have had my eye on "Saving Your Marriage Before it Starts" by Les and Leslie Parrott. However, my marriage is about to start. I hope I win so I can save it! (Just kidding :). Thank you for the encouragement to keep reading. It rewires the brain. I love this contest!! My verse is 2 Timothy 1:7. "For God has not given us a spirit of fear, but of power and of love and of a sound mind." " I sought the Lord and he answered me and he delivered my from all my fears." regarding reading...it has been hard to find the time to be consistent. The best approach has been to wake up an hour earlier than the kids. which is unpredictable and easily sets me up to resent them when they wake early... BUT BUT BUT.... the riches and heart-expanding weight and necessity of reading / quiet time / time with jesus is beautiful. thank you for continuing to nudging us towards wisdom!! Thank you for this encouragement. I do value reading but sometimes get discouraged with how long it takes me to get through a book, especially now with three kids. But since the new year I have felt some encouragement to get through some books that I have been only creeping through until now. So, I'd like to finish up Rocking the Roles as well as Beth Moore's book, When Godly People Do Ungodly Things. I have never created an Amazon wish list. I am going to do that soon...sounds fun! "The Lord your God is in your midst, a mighty one who will save; he will rejoice over you with gladness, he will quiet you by his love, he will exult over you with loud singing." "Now faith is the substance of things hoped for, the evidence of things not seen." I am currently reading "A Little Salty to Cut the Sweet" by Sophie Hudson and "Praying God's Word" by Beth Moore... woot, woot for all those FREE books she shared with us at the beginning of the year! :) I love having a stack to work through! I'm actually working on two verses right now -- one with each of my kiddos -- Sadie is memorizing Romans 10:9 - "Say with your mouth Jesus is Lord. Believe in your heart that God raised him from the dead. Then you will be saved." With Cole I am working on 2 Peter 1:3 - "God has given us everything we need for living a godly life." I also forgot to tell you that "Bread and Wine" has already been on my "to order" list.. .along with Notes from a Blue Bike by Oxenreider, Clout by Catron, and Stronger by Thomas. Okay... I think this is the most I have every commented on someones blog! :) Thanks for sharing the reading love! I'm reading the "Great Divorce" and slowly working through "Practical Theology for Women". I am currently reading Nik Ripkin's "The Insanity of God." It is his and his family's story of doing relief work in Africa and somehow finding God in the depth of horror and grief that existed there at the time. Not sure if more books equal more entries… (wink)… but I'm also working through "The Omnivore's Dilemma" (Pollan) and "Ghost Town" (Johnson), books about food and cholera respectively. "The weapons we fight with are not the weapons of the world. On the contrary, they have DIVINE power to demolish strongholds. We demolish arguments and every pretension that sets itself up against the knowledge of God, and we take every thought captive and make it obedient to Christ." I love this verse! The power to demolish strongholds is God's, not mine. We show up and pray and act obediently, but victory is always the Lord's. "I am still confident of this: that I will see the goodness of the Lord in the land of the living. Wait for the Lord: be strong and take heart and wait for the Lord." Oo fun! I am almost done with "Playing God: Redeeming the Gift of Power" by Andy Crouch. While we often associate power with being corrupt (injustice, idolatry), "power is also the means by which we bring life, create possibilities, offer hope and make human flourishing possible. This is 'playing god' as it is meant to be." Currently I am reading "A Dance with Dragons" by George R. R. Martin but will be adding a more edifying book "Barefoot Church: Serving the Least in a Consumer Culture" by Brandon Hatmaker. I had started in with my wife and really enjoyed the first five chapters. "If you love me, you will keep my commandments. And I will ask the Father, and He will give you another Helper, to be with you forever, even the Spirit of truth, whom the world cannot receive because it neither sees Him nor knows Him. You know Him, for He dwells with you and will be in you." John 14:15-17 **I have been meditating on John 14-15, about abiding in Christ, and about Him abiding in me by the Holy Spirit.